One of the most annoying parts of owning a high-end smartwatch is having to charge it, so what if your watch was actually powered just by sitting on your wrist? That's the question Matrix has tried to answer with the new PowerWatch X. The new watch - announced at CES 2018 - uses a proprietary thermometric energy converter to change your body heat into smartwatch battery. It may sound futuristic, but it's not the first device to have the feature - Matrix released the PowerWatch back in 2016 that used the technology but had limited functionality. 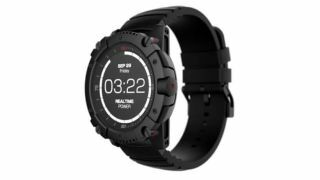 Now the company has announced the PowerWatch X that uses this technology to power a fully fledged smartwatch that can show you notifications from your phone on your wrist. It has a reasonably rugged design and the circle around the inside the bezel shows you how much battery is left on the watch, so it's always easy to spot if it's running out of charge. Exactly what software is running on the PowerWatch X is a little unclear at the moment, but it doesn't seem to be Android Wear from the marketing materials we've seen so far. It'll be able to work with both Android and iOS devices and in the US it'll cost $249.99 (about $185, AU$320). Pre-orders are open now and Matrix claims the watch will begin shipping later this month too.